My practice is devoted to the defense of persons charged with intoxication offenses in Fort Bend County, Texas. During the last few years, I have helped hundreds of people arrested for DWI. I earned my reputation in the courtroom where I vigorously challenge the prosecution’s evidence and contest the State’s ability to meet the constitutional burden of proof. My litigation skills have enabled me to obtain outstanding results for my clients. Perhaps the greatest measure of success is the steady stream of referrals I receive from clients, lawyers, judges, prosecutors and even police officers. I am ready to help you as well. A DWI Lawyer knows this is a highly technical area of law. It is for this reason that I devote my practice to the defense of intoxication offenses, including DWI, Felony DWI, DUI, Driving While Intoxicated with Child Passenger, Intoxication Manslaughter, and Intoxication Assault. 3. Civil case – if your license is suspended as a result of either the criminal or administrative case, a judge may grant you the ability to drive during the period of suspension by way of an occupational driver’s license. As part of our comprehensive DWI representation, my office handles all three cases for a single fee. me with their case, I take that responsibility very seriously. My 18 year old son did something stupid and got a DUI after drinking 2 beers – zero tolerance for under age drinking. We spoke to three different attorneys and chose Mr Segura. We were impressed from the first time we spoke to him and more impressed when we met with him in person. Mr Segura didn’t make any false promises and did an outstanding job of following up on the details of the arrest. The case was dismissed based on weak/incomplete evidence with the condition that my son would attend DWI training/pay court cost and stay clean for two years. Mr Segura worked with for almost a year on this case and his professionalism was second to none. I have referred him to a couple of other folks. This guy is first rate. I read a lot of reviews on Anthony and that is why I chose him. I was very scared being a student in school and never being in trouble before. It was my first DWI and Anthony helped me dismiss it in less than one year! I didn’t even go to trial it was dismissed before we even set a trial date! I can not explain how helpful he is and he never gives up on you! He keeps you informed and gets the job done quickly! I was told by other lawyers that Segura was one of the best so I went with my gut feeling and they were right. I would seriously advise anyone going through any legal troubles to please give him a call cause it’s not to late! Thanks Anthony for fighting till the end! God bless! My experience with Anthony was very long but very well worth it. There was a time I wanted to just give up and take the plea and get my case over with. Anthony convinced me that I have a great chance to fight the case by letting a jury hear my case. I was reluctant at first but I gave in and let Anthony do his magic. Turns out the jury’s verdict was NOT GUILTY. My advice is trust what ever he has to tell you and do not give up on him becasuse he certainly will not give up until his client is satisfied. I want to thank Mr. Segura for helping me get my DWI case dismissed! He is the best DWI defense attorney in Fort Bend County! I would highly recommend him to anyone facing a DWI charge. I appreciate honesty. Mr. Segura never exaggerated or hid the possible outcomes of the case. He was very straight forward on the process from initial stages through the jury trial. He was available via several methods of communication and responded in a timely manner. The particulars of my case, DWI, were difficult but he was able to argue a strong case on my behalf and the outcome was positive. In fact, I was very impressed with his trial etiquette and deliberation. I would definitely recommend him to my closest friends and family. Mr. Segura was a true professional in handling my case. He listened to everything said inside and outside of the courtroom. He knows his stuff and knows how to use it. I said to him during my trial when I was in doubt that “we’ll need to use some of his magic.” He said to me “there’s no magic.” So I watched and listened to him perform and he was right. There was no magic. It was all SKILL. The way he spoke to the witness, the jury, the assistant DA and the judge. He was strong in getting his points across and ultimately helped me win my case. I was obviously happy and relieved with the result of my case. He did his job and did it well. I can’t thank him enough for a job well done. I would definitely refer Mr. Segura to anyone that is in need of an attorney. I strongly recommend Anthony Segura as a defense lawyer. He represented me in my DWI case and got the charges thrown out the window. NO DWI or the headaches that come with it. 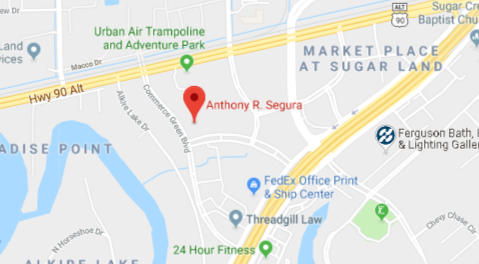 Anthony Segura is the best attorney in Ft Bend County. His knowledge and years of experience are invaluable. He handled the case in a professional and attentive manner. His calm demeanor and years of experience made me feel confident that the case was in the best hands. He understood all of the complex matters of the case and was able to direct it to give us the best defense possible. I would highly recommend Anthony Segura. He is the best choice and will listen to you and then help you plan an amazing defense of your case. Anthony Segura is the king of DWI Attorney. He is very professional and well-trusted. Based on your best interest, he will provide options for the case, so that you will not make another wrong decision. I can not express the gratitude that I feel for all that Mr. Segura has done for not only my husband but for our entire family. My husband was charged with a second DWI in 2014 (his first offense was over 20 years ago). During our initial consultation it was very apparent that Mr. Anthony Segura was the right Attorney for the case. He is very genuine and upfront, always informing us of the best and worst possibilities. He does not candy coat the situation with unrealistic expectations and takes the time to make sure we understood all outcomes. Admittedly he is a very busy attorney (comes with being the best) yet he alway answered our calls. On the rare occasion when he was unavailable Mr. Segura would respond to our correspondences the same day. Although I pray we never need his services again, it is of much comfort knowing he will be there if need be. Again I can’t thank Mr. Segura enough for defending my husband and having his charges reduced from a 2nd DWI to a traffic ticket. In short I most definitely recommend Mr. Segura 100%. I hired Mr. Segura after reading all of the reviews about him and meeting with him in his office. From day one it was all about me. He answered every phone call, email and text. Most within 1 hour of me sending them. He kept me up to date with the status of my case the whole time. I was very confident about his decision to take my case to trial. During the trial he handled himself very professionally. He knew DUI laws better than anyone in the courtroom. He respectfully questioned all witnesses yet still backed them into their own corners. Several times throughout the trial I noticed other attorneys sitting in just to watch him work. More than once I was told “you hired the best in the business”. They were absolutely correct. The situation I had gotten myself into seemed as if there was no good way out. What I walked out of the courtroom with was an acquittal. His work and attention to detail resulted in the charges being dropped completely. The jury never had the opportunity to decide on a verdict. Upon polling the jury after the Judges decision, all 6 returned a not guilty. I wouldn’t recommend any other Attorney for a DUI case. He definitely lives up to his word and proves it in the courtroom where it really counts. Disclaimer: The information provided within this site is offered for informational purposes only. It is not legal advice with regard to any specific facts or situation. Reading this site, or contacting Anthony R. Segura through this site, does not establish an attorney-client relationship.